Hafez Omar, Steadfast People, 2014. Singing in a Cage is Possible and So is Happiness: The Thirteenth Newsletter (2019). Greetings from the Tricontinental: Institute for Social Research. 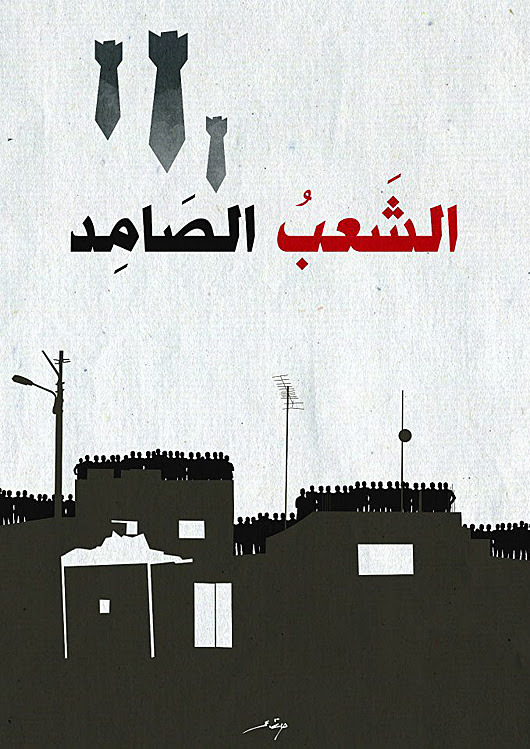 Once more, punctually, Israel – with the vengeance of Zeus – has begun to bomb Gaza. The sounds and smells of war are never absent from Gaza, which has – for the past dozen years – been victim of an Israeli stranglehold and of Israeli bombings. It helps Israel that the United States is fully behind its policy of annihilation. Trump’s colonial declaration – against UN resolution 497 (1981) – to ‘give’ the Golan Heights to Israel has numbed Israel of any ethical concern. With full US backing, it will seize Jerusalem and the Golan and try to do what it wants to Palestine. There is prophecy here. 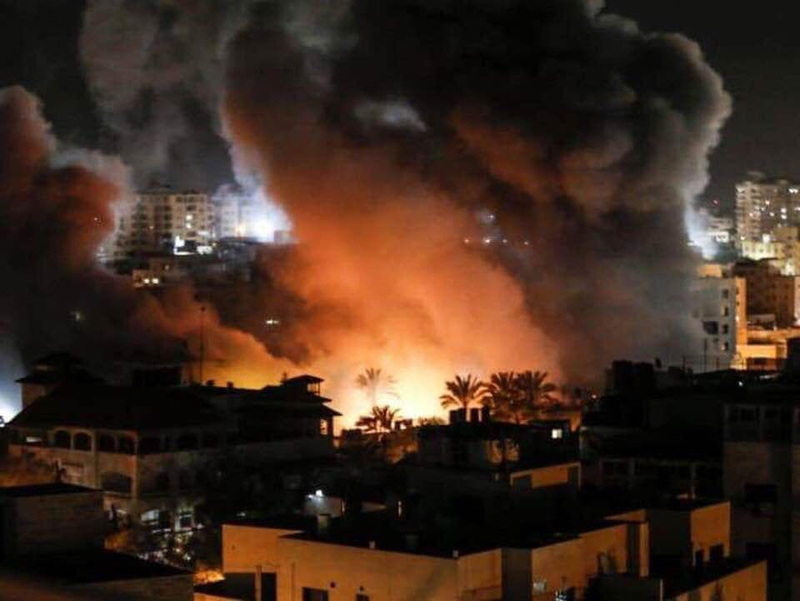 In January 2018, Palestinian journalist Ahmed Abu Artema went out for an evening walk in his home city of Rafah (Gaza, Palestine). He saw birds fly across the perimeter that encages Gaza. ‘No one stopped the birds’, he thought. The Israeli occupation, he felt, ‘clips my wings’ and ‘disrupts my evening walks’. What if a Palestinian from Gaza decides to ‘see himself as a bird and decides to reach a tree beyond the fence’, he mused? ‘If the bird was Palestinian, he would be shot’. He went home and wrote a question on Facebook – ‘What would happen if thousands of Gazans, most of them refugees, attempted to peacefully cross the fence that separated them from their ancestral lands?’ The answer, plainly (as I underscore in my report on the March), was that they would be shot. A year ago—on Land Day (30 March 2018)—, the Palestinians of Gaza, inspired by Abu Artema, began the Great March of Return. They walked to the Gaza perimeter fence in the tens of thousands and were shot down by tear gas and Israeli snipers. With thousands injured and with hundreds of dead, the United Nations released a report that accused the Israeli military of war crimes and asked the Israeli government to investigate these accusations. Instead, the government of Israel did not cooperate with the inquiry and it dismissed the commission’s report. The canary remains in the cage, singing to the passing snipers, and now to the bombers. Linda Tabar, Director of the Centre for Development Studies (Birzeit University, Ramallah, Palestine), writes to us that the ‘one year anniversary of the Marches to Return and Break the Siege in Gaza forces us to pause and interrogate the failures in conscience that mark the indifference with which the world has watched as unarmed Palestinians have been targeted with snipers and gunned down for defying the colonial enclosures and seeking to free themselves from an open-air prison and seeking to return to our lands’. The picture above is by our friend Hafez Omar. He is an artist from Tulkaram (Palestine). On 14 March, Israel’s Ofer Military Court ordered that he be detained for twelve days. His appeal was rejected by the courts on 20 March. It has now been over a dozen days. He remains in prison, without access to his lawyer. Please contact the Israeli authorities and tell them to release Hafez Omar and to stop bombing Gaza. Tell them, while you have them on the phone, to end the occupation of Palestine. 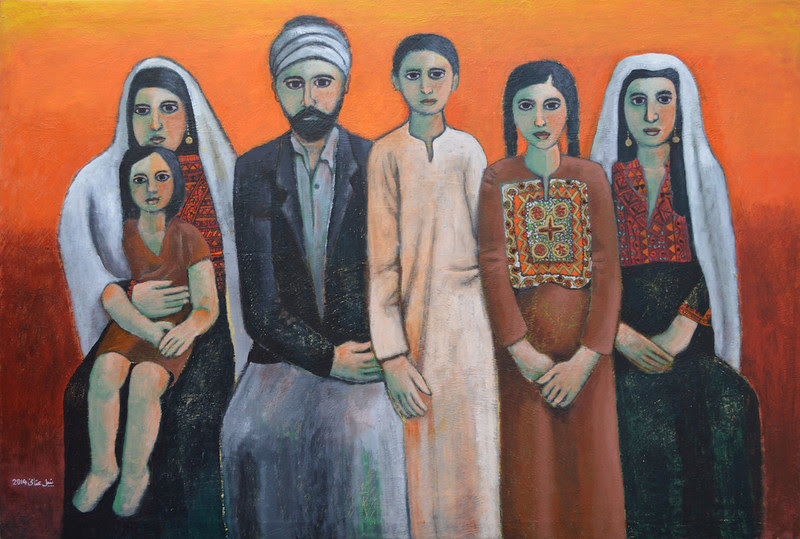 Nabil Anani, Dadoub Family, Bethlehem, 1900. Discussion of the Israeli occupation of Palestine raises the inevitable sense of futility, the endless questions about what must be done. And here, there is truly an intractable political landscape. Is there a path out of the occupation of Palestine, the denial of rights for the Palestinians to return home? The UN-mandated position is for a ‘two-state solution’ for Israel and Palestine to exist side-by-side. It is what both sides have notionally accepted. The basis for this is UN resolution 242 (1967) and UN resolution 338 (1973). Both resolutions call for the withdrawal of Israeli forces from East Jerusalem, the West Bank and Gaza. They call for a ‘just settlement of the refugee problem’ and the guarantee of the Palestinian territory. The settlement policy, which began in earnest under Ariel Sharon’s Agriculture Ministry in 1977 and continues with official encouragement, invalidates the two-state solution. Israeli settlers dominate the government. They are not to be trifled with inside Israel. They have vetoed a two-state solution. They have begun to annex what they call Judea and Samaria. Their language first seizes the area. Then they begin to build settlements. This provokes Palestinian reaction. Then come the walls, the checkpoints, the bulldozers, the destruction of Palestinian life, the humiliation – all designed to raise the cost of life and allow the Palestinians to decide to flee. Teju Cole calls the process ‘cold violence’. ‘Putting a people into deep uncertainty about the fundamentals of life, over years and decades’, he writes, ‘is a form of cold violence’. What we see here – beside the bombings – is cold violence, slow violence. The Israeli position, if we are frank, is not for a two-state solution, but for a three-state solution – to push the Palestinians into Egypt, Jordan and Lebanon. It is an annihilationist policy (to get rid of the Palestinians) and an annexationist policy (to seize Palestinian land and resources). The just position is for a one-state solution, but this has been rejected by the Zionists. An early UN resolution 194 from 11 December 1948 affirmed that the expropriated Palestinians had a right to return to their homes ‘at the earliest practicable date’. There was hope that the various communities would find a way to live together, and that a secular political solution would be created for the people. It was not to be. Today, this solution is hard to imagine, as the Zionist Right becomes Israel’s Extreme Centre. The idea that Israel is a Jewish State makes the one-state Solution impossible. Israel’s Prime Minister Benjamin Netanyahu is on record saying that his preferred solution is ‘a demilitarized Palestinian state that recognizes a Jewish state, the nation state of the Jewish people’. As long as the Israeli political class – which dominates the discussion – pushes hard for this ethno-national identity, a one-state option is off the table. What you have is apartheid. Israel is an apartheid state and society. The Israeli ruling class will not permit the Palestinians to have full citizenship in a unified Israel-Palestine. This they have said so plainly. Larissa Sarsour, Nation Estate, 2013 (nine minutes). What remains for Palestine? If you watch Larissa Sansour’s nine-minute film, Nation Estate (2012), you find yourself in a building that is Palestine, with its cities (Ramallah, Jerusalem) on different floors. It is a remarkable science fiction picture of Palestine today and into tomorrow. We are in a state of endless occupation. This is not futurism, but the essence of the present. Larissa Sansour comes after Sulafa Jadallah (1941-2002). Jadallah’s art is linked inextricably to the politics of the Palestinian Liberation Organisation (PLO), in whose Photography Division she began her career. Photographs of Palestinian refugees and of Palestinian fighters (fedayeen) provided an inspirational tableau of their struggle. Jadallah joined the newly formed Palestine Films Unit, where she made several important films for the struggle towards freedom. We honour her to honour the dreamers and the visionaries, the caged birds who refuse to stop singing. 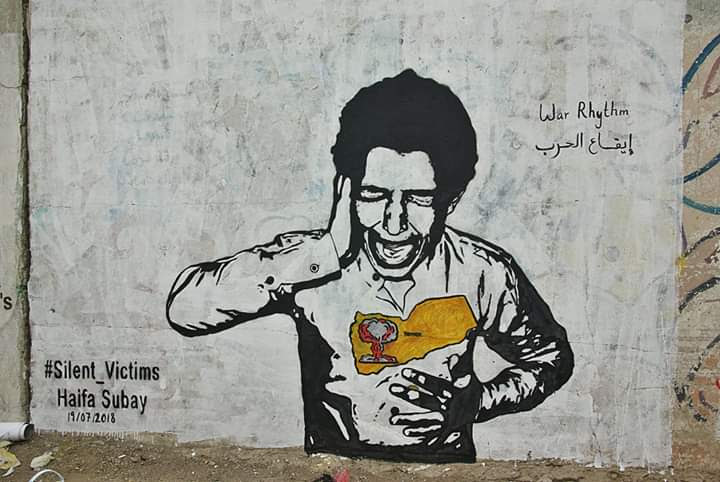 Haifa Subay, Silent Victims, 2018. Yemen has entered the fifth year of the Saudi war on that country. It is a forgotten war, a war with no end. It is a war like the US war on Afghanistan. It is a war like the long-drawn out war against the poor, whose lives cannot start as their choices are circumscribed by trade policy and the investment strike by the 1%. It is a war that the Palestinians know, that the Cubans know, that the people of the Democratic Republic of the Congo know, a war that is known very clearly to the people of Venezuela. In this war, the canary in the cage cannot find its way out but nonetheless continues to sing. The canary dreams of a world where the bars of its cage melt away and where it will be able to fly from one end of the planet to another. It will fly along with Abu Artema’s birds, across the perimeter, looking for the last sky. PS: to read our materials, please go to our website. Our newsletter is available in English, French, Portuguese and Spanish. So are our dossiers, the most recent being on the danger to the Amazon in Brazil.